The prevalence of Diabetes is increasing among Indians. So is the prevalence of Heart Disease. Heart Disease in diabetics is 2-3 times more common than in non-diabetics and remains a leading cause for mortality and morbidity warns, Prof.R.S. Hariharan, Professor and Head, Department of Diabetology, Madras Medical College and Chief Diabetologist, Government General Hospital, Chennai. These are some of the heart diseases. Diabetes affects the blood vessels of the heart resulting in Angina and Heart Attacks. It affects the heart muscle leading to Heart failure It also affects the nervous control of the heart resulting in Arrhythmias. The involvement of the electrical wiring of the heart leads to heart blocks. Thus Diabetes has a multipronged attack on the heart. Also read: How should you react when you have a heart attack? Peculiarities of heart attacks occurring in Diabetics. Diabetics develop heart attacks at a much younger age than non-diabetics. Ordinarily, heart attacks are more common in men than women. But once Diabetes develops, the risk of women developing heart attack is as high as in men. Further, in general, women do not develop heart attacks in their reproductive age group i.e. before attaining menopause. But diabetic women develop heart attacks even during their reproductive age group. In other words, Diabetes takes away the advantage of being a woman as far as a heart attack is concerned. 3. Why do diabetics develop heart attack more often than non-diabetics? Diabetics have obesity, Hypertension and raised levels of blood fats such as Cholesterol and Triglycerides more often than non- diabetics. The blood vessels of diabetics age faster than those of non-diabetics. For instance, the blood vessels of a diabetic aged 60 years who has been having Diabetes for 20 years are as old as those of 80-year-old non-diabetics, because the age of his blood vessels is his age in years plus the duration of Diabetes, and therefore 60+20=years. the severity of heart attacks in diabetics is also much more than in non-diabetics. with unusual symptoms such as exhaustion, weakness, nausea, vomiting or breathlessness. Likewise, generally, non-diabetics with a heart attack do not develop sudden cardiac arrest after 48 hours from the onset of a heart attack but diabetics quite often develop delayed sudden cardiac arrest due to Arrhythmias and standstill. Therefore, while 48 to 72 hours of intensive monitoring is considered enough in non-diabetics such as monitoring for even up to 5 days becomes necessary in diabetics. Recurrence of heart attack is also more common in diabetics compared to non-diabetics. Such a re-infarction can occur even during the period of hospitalisation for heart attack. 7. Why is heart attack occurring in diabetics more complicated? Heart attack occurring in a diabetic is more complicated because of the adverse effects of Diabetes on the heart muscle, nervous control of the heart, nature and extent of obstructions of the blood vessels of the heart, as well as high levels of blood sugar, during a heart attack. The inability of the heart to pump blood to the various parts of the body due to weakness of its muscles is called pump failure or heart failure and it can affect the contracile (systolic dysfunction) or relaxation (Diastolic Dysfunction) function of the Heart. Failure of the pumping functions of the left ventricle is called Left Ventricular Failure while that of the right ventricles is called Right Ventricular Failure. When both of them fail together it is called combined cardiac failure or congestive cardiac failure. The causes of Left Ventricular Failure are many, such as Hypertension, Ischaemic Heart Disease, disease of the valves of the heart etc. In addition, Diabetes by itself can be the cause for the weakness of the muscles of Left Ventricle and this is described as Diabetic cardiomyopathy. Shortness of breath on exertion that progresses to shortness of breath even at rest, cough on lying down, swelling of the legs and decrease in the amount of urination point to heart failure. “Asthma-like-wheezing” and sudden onset of breathlessness for the first time after the age of 40 years should raise the suspicion of heart failure and should not be neglected. For, it is a medical emergency that may cost one’s life if not recognised in time. At times, it may even be a symptom of heart attack. ECG taken after a controlled exercise on an equipment called Treadmill. Echo cardiogram to assess the muscle function of the heart apart from any valvular defect. Coronary Angiogram to determine the nature, extent and severity of blocks in the blood vessels of the heart. Now let us see how heart diseases affect Diabetes. The heart attack leads to uncontrolled diabetic state. Blood sugar raises abnormally. 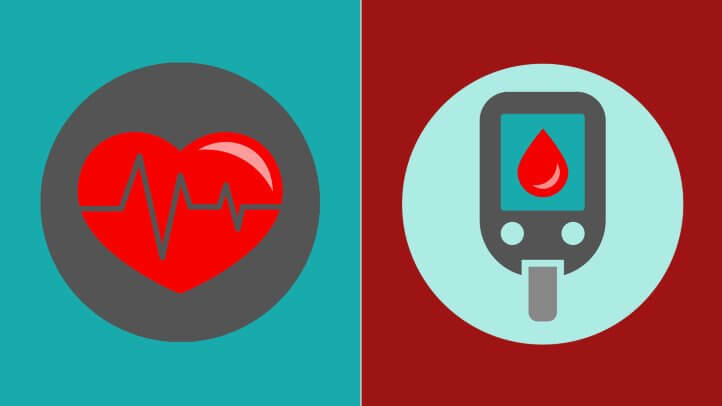 At times even non-diabetics develop high blood sugar level during Heart Attack. However, diabetics can develop what is described as Diabetic Ketoacidosis during a heart attack, which by itself is a life-threatening condition. All this requires the use of insulin rather than oral drugs for the control of Blood Sugar. What Can A Diabetic Do To Prevent /Decrease/Postpone the occurrence Of Heart Disease? Life Style Modification (LSM) is the sheet-anchor in the prevention of Heart Disease in diabetics as in non-diabetics. This includes weight reduction in the obese, adherence to an appropriate diet such as a low-calorie, low-fat, largely vegetarian diet, cessation of cigarette-smoking and moderation in alcohol consumption. Physical exercise is yet another important aspect in the prevention of Heart Disease that is sadly missing in the Indian subcontinent. These should be followed by efforts at modification of other risk factors such as control of Diabetes, Hypertension and blood fats such as Cholesterol and Triglycerides.